Secret conspiracies are everywhere. 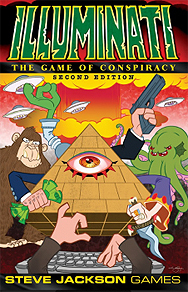 Now this classic game has been updated for the 21st century with new cards, alignments, and art. Build your wealth and power, control groups ranging from the Goldfish Fanciers to the CIA, and take over the world! Have you got a sense of humour? Do you like your games to be not too serious? If you answer yes to either of these questions then this is a game for you. I must admit to being a little pre-judgemental about this game as I first had a copy around 20 years ago, and thoroughly enjoyed it back then. It is essentially the same game now as it was then. The basic idea is to satisfy the victory conditions of your particular illuminati by controlling various "groups", making money, bribery and pretty much anything else you can get away with. This game is ideal for around 4 - 5 players, who just want a light-hearted relaxing game. Recommended! !